Events like yesterday’s bombings at the finish line of the Boston Marathon make us feel terribly vulnerable. Our first thought is that we might know people who were running the race, or that friends or relatives in Boston were planning to spend their Patriots Day Holiday watching runners finish the final mile. Marathon organizers estimate that 500,000 people line the course annually to cheer on an average of 20,000 runners. When the bombs went off yesterday afternoon and news reports began to disseminate all over the world, thousands and thousands of people picked up a phone to assure themselves that their friends and acquaintances in Boston had not been hurt or injured. Cell phone networks serving eastern Massachusetts were promptly jammed and no one could reach anyone for several hours. This is not an unusual occurrence after a serious disaster. Communication between the outside world and the people experiencing the disaster becomes difficult. Overwhelmed cell phone networks, power outages and requests for people to “shelter in place” make it difficult to get the word out that everything’s okay, and perhaps a grandmother on the West Coast should not be worried. The American Red Cross runs an essential service to help people get in touch during a disaster. 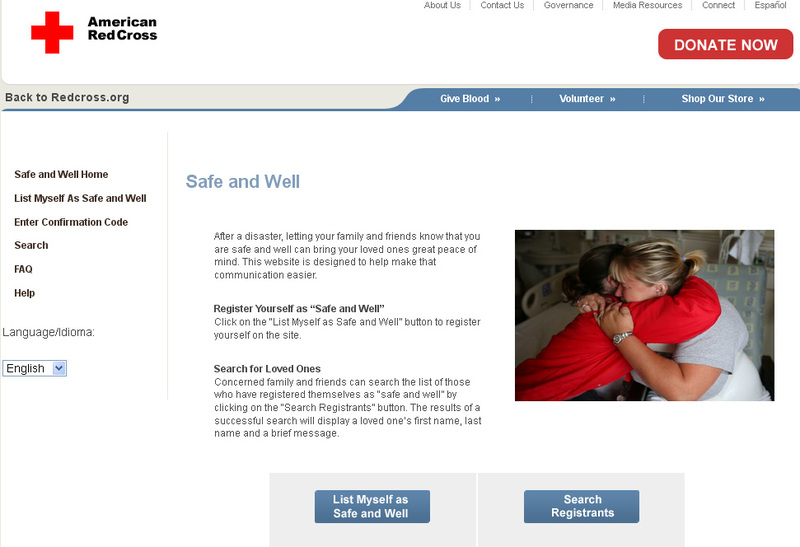 On the Red Cross website, visitors who are in an area affected by a disaster can register themselves as “Safe and Well” by entering place of residence information and choosing a brief message that explains their status. That information can be accessed by anxious friends and relatives who can’t reach their loved ones through traditional channels. Perpetrators of terrorism mean to hurt and maim, but they also mean to make us afraid. A service like “Safe and Well” works to establish peace of mind. It begins to heal the injury to our psyches. To get the the website pictured above, go to redcross.org/safeandwell. Also, check out this helpful video.